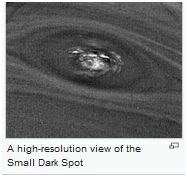 "The Great Dark Spot (also known as GDS-89, for Great Dark Spot - 1989) was one of a series of dark spots on Neptune similar in appearance to Jupiter's Great Red Spot. GDS-89 was the first Great Dark Spot on Neptune to be observed in 1989 by NASA's Voyager 2 spaceprobe. 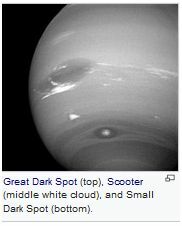 Like Jupiter's spot, Great Dark Spots are anticyclonic storms. However, their interiors are relatively cloud-free, and unlike Jupiter's spot, which has lasted for hundreds of years, their lifetimes appear to be shorter, forming and dissipating once every few years or so. 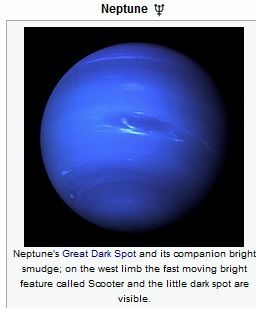 Based on observations taken with Voyager 2 and since then with the Hubble Space Telescope, Neptune appears to spend somewhat more than half its time with a Great Dark Spot" "The Scooter is another storm, a white cloud group farther south than the Great Dark Spot. This nickname first arose during the months leading up to the Voyager 2 encounter in 1989, when they were observed moving at speeds faster than the Great Dark Spot (and images acquired later would subsequently reveal the presence of clouds moving even faster than those that had initially been detected by Voyager 2)" "The Small Dark Spot, sometimes also called Dark Spot 2 or The Wizard's Eye, was a southern cyclonic storm on the planet Neptune. It was the second most intense storm on the planet in 1989, when Voyager 2 flew by the planet. 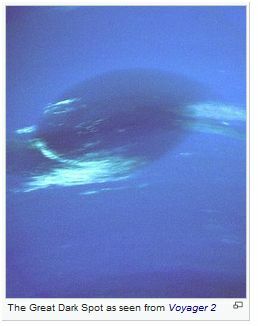 When the Hubble Space Telescope observed Neptune in 1994, the storm had disappeared"
"Neptune resembles Uranus in its magnetosphere, with a magnetic field strongly tilted relative to its rotational axis at 47° and offset at least 0.55 radii, or about 13,500 km from the planet's physical centre. Before Voyager 2's arrival at Neptune, it was hypothesised that Uranus's tilted magnetosphere was the result of its sideways rotation. 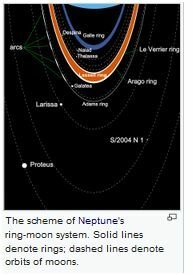 In comparing the magnetic fields of the two planets, scientists now think the extreme orientation may be characteristic of flows in the planets' interiors" "The rings of Neptune consist primarily of five principal rings and were first discovered (as "arcs") on 22 July 1984 in Chile by Patrice Bouchet, Reinhold Häfner and Jean Manfroid at La Silla Observatory (ESO) during an observing program proposed by André Brahic and Bruno Sicardy from Paris Observatory, and at Cerro Tololo Interamerican Observatory by F. Vilas and L.-R. Elicer for a program led by William Hubbard. They were eventually imaged in 1989 by the Voyager 2 spacecraft"
"In contrast to the hazy, relatively featureless atmosphere of Uranus, Neptune's atmosphere has active and visible weather patterns."